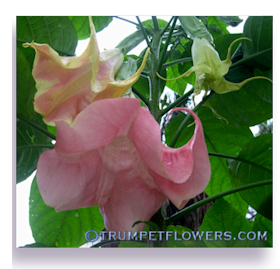 TrumpetFlowers.com∼Brugmansia Blog for February 2014, Green Wood Brugmansia and Rockwool Rooting? Green wood on brugmansia is usually unsuitable for propagation. In all cases I&apos;ve ever seen, it just turns to mush. But I&apos;m having some success with rock wool as a vector, at least so far. Last month I purchased some small rockwool cubes from Amazon. I&apos;ve never used rock wool before, but other Brugmansia growers have touted it&apos;s good use, so I thought I&apos;d give it a try. It looks a lot like the old fashioned pink (this rock wool is green) spun fiberglass they used as insulation, but without the scratchy effects after touching it. It&apos;s also a bit more solid. It holds water very well, and yet it also drains, creating the air circulation needed around cuttings in order to root. I tried several different plant species in it, just playing around. After about 4 weeks, I could see it did very well with the vines I&apos;d cut and planted in the rock wool. 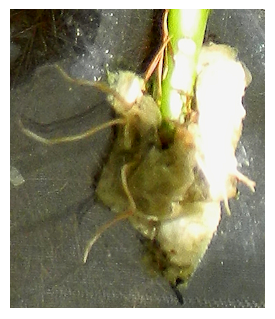 The roots were already coming out of the sides and even going into the surrounding cubes. By the 6th week, I was placing the rock wool cubes with rooted vine cuttings into small starter pots filled with soil to let them grow out. It was at this time I knew I needed to take some other plant cuttings before the sultry Florida weather brings on too much heat for me to do so. We&apos;d had a bit of a wind storm the day prior, and while I was out gathering up the latest batch of cuttings, I saw a small, green branch had been snapped off of one of the brugmansia. What a pity I thought, it was beautiful growth, and I hated to lose it. But it was as green as the grass, no hint of hardening, so my heart sank. I was going to lose it for sure, no chance of rooting this up. But being stubborn, I picked it up anyway, and took it into the green house along with my other cuttings. After getting them all sat into the rock wool cubes, I put the snapped green wood brugmansia cutting in one too. Whenever I use any propagation medium, I always make up a weak batch of Miracle Gro Tomato plant food and add a few drops of Superthrive to rainwater. This is what I initially water the cuttings with. Since they are no longer attached to the mother plant, they need something to eat to get them going on roots and new leaves. A month has passed, and to my surprise, there are two tiny, new leaves appearing on the green wood brugmansia! I looked at the base for rot, and so far there is none. I don&apos;t see any roots peeking out yet, but am holding my breath over the next two weeks to see if any appear. If they do, I have found a successful method of rooting up green wood of brugmansia! The only other tried and true method of doing this is by air layering, which is time consuming and not cost effective, at least in my case. Well, it&apos;s March the 14th, and I just checked Shooting Star, and he has roots! Yay! I have finally found a great way to propagate green wood brugmansia. I&apos;m very excited about this method, and have already ordered some more Rockwool, to make more. I need to cut on Flame before it&apos;s too late in the season. 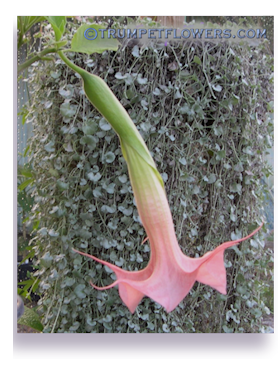 This entry was posted on February 22nd, 2014 and is filed under Brugmansia Blog.